Price: £6.65 (incl VAT) Sorry, this item is currently unavailable. Click here to receive notification when this product comes back into stock. 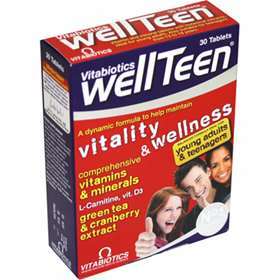 Wellteen by Vitabiotics has been specifically formulated to provide a comprehensive range of micronutrients, vitamins and minerals, to help support the daily nutritional requirements of young adults, and is also ideal for teenagers aged 13-19 years. Ideal for young adults and teenagers. How does Wellteen support health and energy release? Wellteen contains B-complex vitamins which are important to help maintain energy release, while iron may help support physical and cognitive performance. Vitamins A,C,E and minerals zinc and selenium, play a number of key roles in the body and help to maintain all round health and vitality. How does Wellteen support the immune system? Wellteen contains a range of antioxidant nutrients including Vitamin C, zinc, selenium and green tea extract help maintain a healthy immune system. Recent research has also shown that optimum dietary levels of Vitamin D may be higher than previously thought and Wellteen provides effective levels of the preferred D3 form. How does Wellteen help concentration and brain function? Wellteen contains iron and zinc which are two of the most abundant minerals in the brain and may play a role in maintaining healthy brain function. Iron is especially important in relation to learning and memory and may help to maintain concentration levels. One Wellteen tablet to be taken once a day with your main meal. The Wellteen tablet should not be chewed and you should not exceed the recommended dose. Wellteen can be taken for as long as required. Wellteen contains iron, which if taken in excess by very young children may be harmful. As with other supplements, seek professional advice before using if you are under medical supervision, are pregnant, breast-feeding or suffer from food allergies. Product code: 3585312 Price: £6.65 (incl VAT) Sorry, this item is currently unavailable. Click here to receive notification when this product comes back into stock.